Question: What’s the difference between incidence and prevalence? That's a great question. It gets at some of the foundations of the field of epidemiology. Incidence and prevalence are both ways of measuring the frequency and spread of diseases. Depending on the problem you're trying to solve in your community, one measure might be more useful than the other. Incidence measures new occurrences of a disease in a population over a period of time. It gives you an indication of the risk of contracting a disease. In order to focus on new occurrences, you start by looking at a population that does not have the disease, and then follow it over time to count the number of people who get the disease. Prevalence measures existing cases of a disease, or simply put, it tells you how widespread a disease is in a given population. You can look at the prevalence of a disease either at one particular point in time or over a period of time. 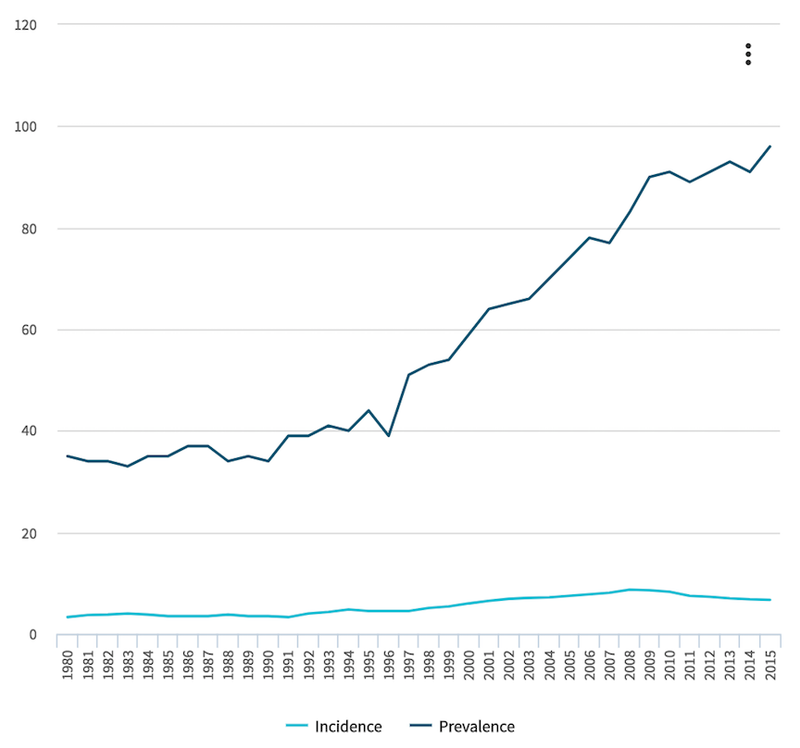 If you are interested in prevalence over time, your numerator would include both the existing cases at the beginning of your time period as well as any new cases that occur during that time period. If the problem you’re trying to solve in your community focuses on the cause, prevention, or treatment of a disease, it would be helpful to understand the incidence of the disease because it focuses on the contraction of the disease. On the other hand, if your community is interested in looking at resource allocation for treating a disease, you may find it more useful to look at prevalence. The chart below compares incidence and prevalence data from LiveStories most recent Diabetes Report. Source: US Diabetes Surveillance System; www.cdc.gov/diabetes/data; Division of Diabetes Translation - Centers for Disease Control and Prevention.